Pride is proud to offer a comprehensive club program for Boys and Girls of all ages and experience levels. The mission of Pride Water Polo Academy is to deliver premier instruction in the sport of water polo through an open club system as well as the Pride Academy in an effort to develop competitive teams and maximize the potential of each athlete. The primary objective is to develop each participant as both an athlete and a young person. The Pride Water polo Academy is committed to the development of each athlete regardless of age or ability level. All of the Pride programs are open to athletes that range in experience from novice to advanced. Pride is dedicated to developing athletes in the following areas- technical fundamental skills, tactics, conditioning, and general knowledge of the game. In addition, the coaching staff pledges to develop each participate both as an athlete and as a young person. Participation in Pride Water Polo Academy at any level including the free week trial requires a current membership in USA Water Polo. Please use the Pride Water Polo Club ID number when registering for USAWP or changing club affiliations: Club ID Number (25981). Tournament Fees will be paid in addition to Session Fees. There will be a flat tournament fee per session (excluding Junior Olympics & Qualifiers). Each cost will be inclusive to each team based on number of tournaments participated in each session. All members on the team will be responsible to pay the full tournament fee. Want to give water polo a try – Stop by the pool and see us in person! If you have an athlete that wants to give polo a try, stop by one of our practices and hop in! Or just watch, whatever you’re comfortable with. We’ll grant you a couple free practices. All we ask is that you sign a registration form & waiver. We have them at the pool too. Prides’s Splashball program is designed to introduce the sport of water polo to children between the ages of 5 and 9. The program teaches some of the basics of water polo to first time players while focusing on teamwork, fun and sportsmanship. Although some basic swim skills are required, players can stand on the bottom of the pool. A water polo program focused on skill building and tactics. This program is open to all level players from novice to advanced. The Pride coaching staff offers a water polo curriculum developed by the Technical Director to enable each athlete to reach their full potential. The 14U program is focused on fundamentals technical skills and basic game tactics. This program is open to all level players. The Pride coaching staff delivers a curriculum developed by the Technical Director to build a fully developed foundation of ball skills, body positioning, basic tactics, and conditioning. The 12U program is focused on an introduction to the game, basic water polo skills, fundamental technical skills, and foundational tactics. The coaching staff provides a fun atmosphere for young athletes to learn the basics. This program includes foundational skill building and swim stroke development for players new to Water Polo. Players are also taught team tactics and experience various player roles to deepen their understanding of the game. The Pride Water Polo Academy accepts applications for financial assistance but cannot guarantee that all requests for scholarship and financial aid grants will be accepted. Application for financial assistance must be submitted for each session as part of session registration and will be evaluated by the Board of Directors. Click here for more information. 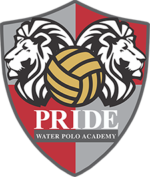 Please click below to register for Pride Water Polo Academy.